Alright, I’m back at the keyboard to report out on how week 1 went for the ORC. Yes, that’s right, the One Room Shall-ange. Some have commented, “changing out some pillows and painting new colour is a challenge, what you’re doing is nearly impossible.” But folks, I never back down from a struggle, so here I am. Thanks again, Linda from Calling it Home, for putting all this all together. You can check out all the featured designers here to see what they’ve been up to, and everyone else who is a guest, like me, here. Let’s take a look at where we’re at. Of the 20 some odd list of things I need to do to achieve the look I want…this week, I added a few more things to the list and somehow I’m still on track. I realized that I actually needed some more electrical wiring done as I went to confirm the lighting I wanted. So at this stage, I’m feeling great about the lighting. Thank God my brother is an electrician on speed dial and will pretty much take my calls any time of the day or night. He was a great help over FaceTime (God bless Apple), by telling me all what was possible, recommending where to put things (particularly so as not to hit our heads on anything), and then what supplies I needed to get. So after a few frantic phone calls, he helped me sort it out. I even Facetimed him while at Lowes! The Jiprock was not totally foreign to me since we had jiprocked the whole inside of our basement before - although I was much more the oversear in that case. 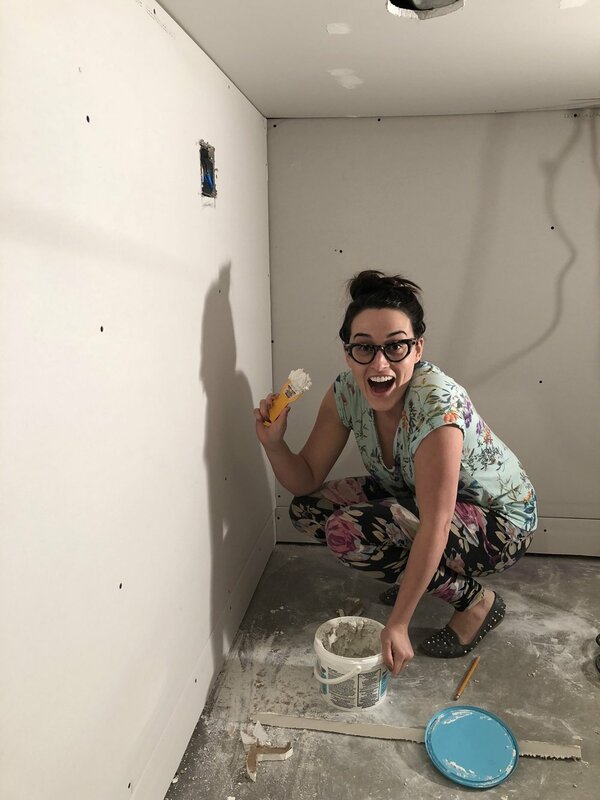 This time I actually had to get my hands dirty…and pretend I was Sampson holding up a sheet of drywall to the ceiling while my husband drilled in the screws. I think that was the least fun part so far…words were said. LOL. Side note, now I know that you should put the ceiling up BEFORE the walls. Good tip! Ok, and when I say, “sort of CHECK”…well that mostly because I cut a lot of corners on the mudding and taping bit. Friends, there is a REASON that professional mudders and tapers are professionals. And to be quite honest, learning to mud and tape is not on my bucket list. So there was mud…there was no tape. Because this is in a small play room for kids, and will either be covered in trees or upholster (ooo yah! upholstery, I’ll get to that later), I didn’t feel it worth the time or money to invest in new tools or spend the time getting all those details right. So if there was a place I was going to cut corners on this job…it was going to be this. (P.S. 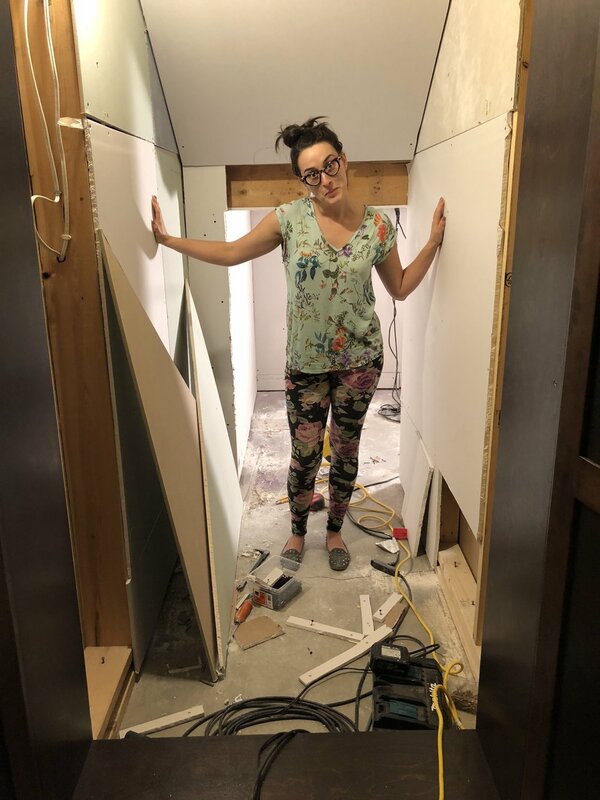 for most rooms, like furniture, your foundation is nearly the most important thing, so probably get a professional and don’t DIY this yourself). I love green, it’s my favourite colour in more ways than one. 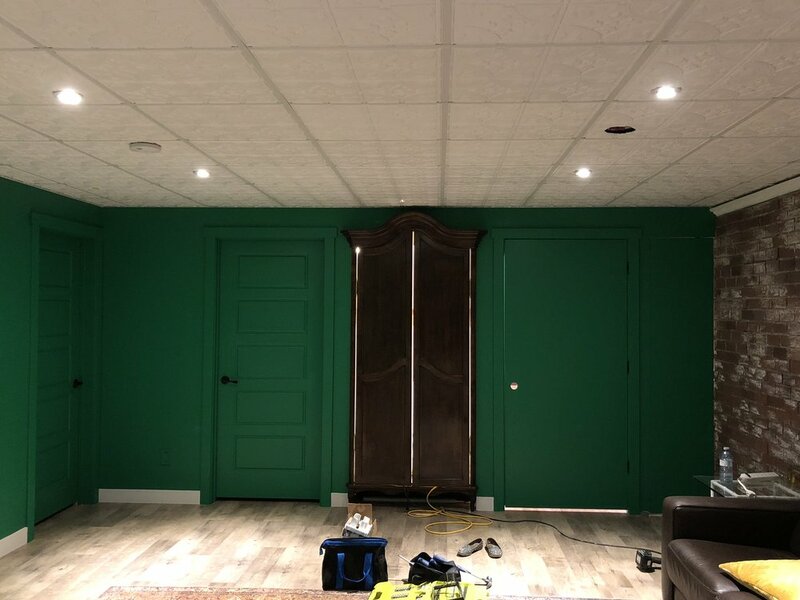 This is the first time I’ve ever painted an ENTIRE room in green though. Here were some of my inspiration pics behind the decision. 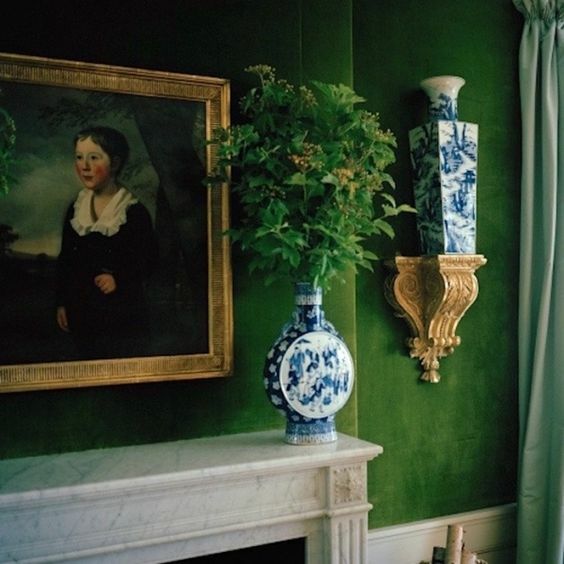 I will forever worship at the alter of Miles Redd, Tony Duquette, Hutton Wilkinson, Dorothy Draper, and Mario Buatta…just to name a few of my interior idols. So it’s no surprise that I had seen some of their work in green and found my own inspiration. (Left to Right: Miles Red, Hutton Wilkinson, Daniel Romualdez for Tory Burch, and JAB Anstoetz). 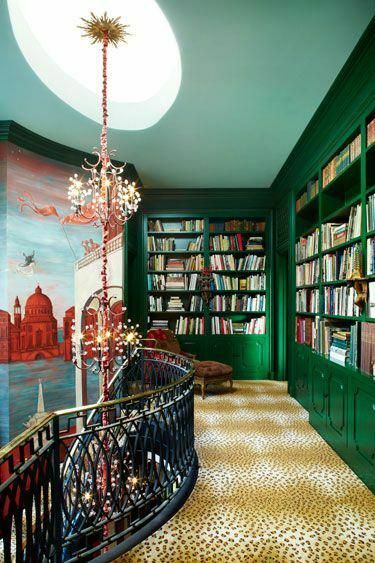 My husband first walked downstairs and said, “I love the green; I hate that you painted the trim and doors too.” After sending him several of my inspo pics to show him where I was going with this he immediately responded, “You’re right, I’m wrong; I trust you.” Music to my ears. And words I won’t let him forget! I’ve had a few, and by a few I mean COMPLETE, changes in the fabric department. All the things I was going to do changed. Fabric Change No. 1: For pillows I wanted the Lotus Garden in Lacquer. Unfortunately for me, when the sample arrived it was much more burnt orange than the corally red I was going for. On to plan B! The Peacock Red is a chintz “inspired by an archival fabric and evokes the 1930s designs of John Fowler and Nancy Lancaster, the famed duo credited with creating the English country look.” So while I have to carefully walk the line combining green and red and hoping it doesn’t end up looking like a Christmas card, I’m going to break the rule on this combo and do it anyway. I’m not 100% committed to this yet though - so I’m going to keep looking over the next few days and hopefully come across my perfect selection. Stay tuned! This one is less extreme as I’m staying with the same fabric, just switching colour schemes. Originally, I wanted wall to wall green and then accents of art and decoration to cover it. 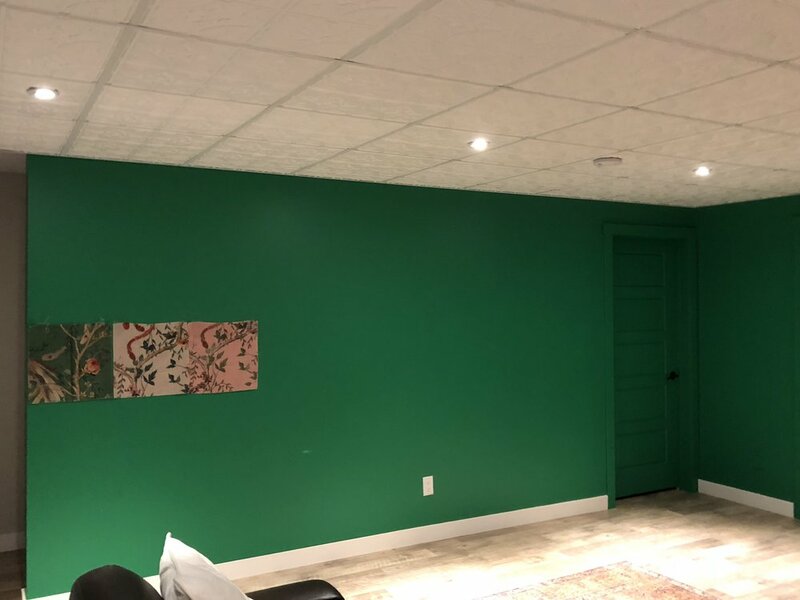 However, because this is a basement, I was worried the green that matched the fabric best was too dark for a room that receives considerably less light. So I chose a lighter green for the walls, and then I didn’t love the green fabric that I originally intended. So, I switched to pink because I’m so in love with the chinoiserie style of this print, and the scale…it is unbelievable hard to find this at a decent price, so I hit the jackpot here. Fabric Change No. 3: well this one isn’t really a fabric change, it was just a brainwave that included fabric that hadn’t occurred to me before. So it took a little time deciding on options this week once I decided to go with it. First of all, I don’t enjoy typical kids stuff. When I had kids, I didn’t want the house to be taken over with their things. After all, this is still MY house. Of course you go through the first year of a babies life when there are exersaucers, jolly jumpers, and play mats all over the place just to keep them entertained, but after that - ENOUGH! I want my house back. I’m sure I’ll evolve and things will change as kids grow older and become more and more firm in their own opinions (which I want, btw), but for now…I still get to pick, and hopefully create something little Winnie will love to pieces. So in the Imaginarium, the place for imagination, reading, and all sorts of play…I was at a loss for what to do on the walls. I hunted for wallpaper and murals; I even tried finding an artist to paint a mural…or at least help me paint it. Dead ends. Nothing I turned up seemed like the right fit. All the kids play room murals…were just too…kiddish. Now, hear me out…there are great people making wonderful things for kids. But I’d give Winnie sofie the giraffe and all she’d want is my wooden spoon to chew on. I’ve learned kids aren’t only attracted to kid things. So I opened up the viewfinder a little and - VOILA! Enter in William Morris’ The Strawberry Thief, which incidentally an original is on display at the Victoria & Albert Museum in London. Being that it is a historical print, first produced in 1883, I believe that this will fit perfect with the theme of the room. It’s so colourful and imaginative and takes you to the forest setting where moss grows and birds peck at wild strawberries. I also read so many stories of historical characters to Winnie like Ada Lovelace, Harriet Tubman, and Jane Austen. Teaching her history and letting it inspire the world we currently live in is important to me, so it feels extremely suitable in this room. So that’s where I’m at so far. Follow along on Instagram @britandbarclaydesigns for all the behind the scene footage! Thanks for following along and don’t forget to check out the other participants! !